FEEBLEBMX.COM Feeble BMX Vancouver - H.O.V.!! Confederation Park is a large asphault area surrounded by chain link fence. 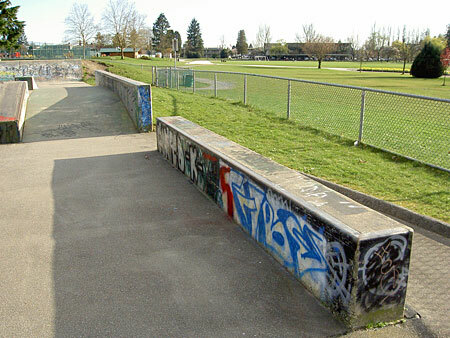 There is a slam wall on at the south end of the park that feeds you down onto the main area with two pyramids the first being 1.5 feet high and maybe 5 feet long. The second pyramid is 4 maybe 4.5 feet high and about 2 feet square on top. 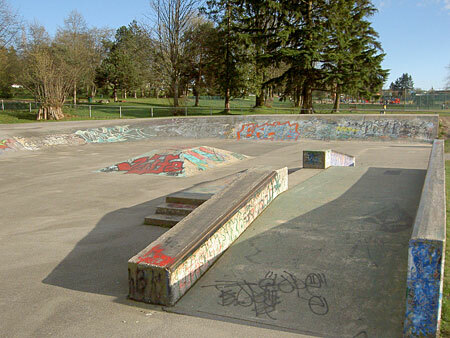 A fun park if you a beginner as there are six different ledges to learn grinds on of varying height (ranging from as low as 20cm to as high as 80cm) this includes both flat and sloped ledges. Confederation also has it own mini bowl, small with steep walls, probably not the best bowl to ride in if your just starting out. This is a good place to come to practice you tricks as you can manual around the perimeter of the park, grind ledges, learn spins off the various lips and slopes and just hang out. There are almost always skateboarders so you'd better be prepared to share the park. From Downtown catch the Skytrain to Broadway Station and transfer to the Millennium Line. Ride to Brentwood Mall Station and catch the 130 Hastings/Kootenay Loop or the 123 Kootenay Loop. Ride the bus untill you hit Hastings (takes about 3 min). 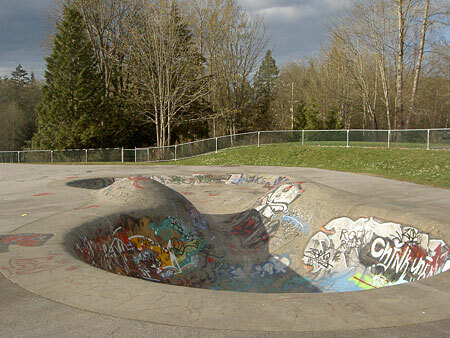 Ride your bike North (towards the mountains) from the corner of Hastings and Willingdon for two blocks, when you see the large community center on the right follow the large running track (its oval) around untill you see the skatepark in the back corner. Funbox thing with sloped ledges for either side. Small pyramid and slam wall in the background. Round bowl with hips and super shallow end.